In memory of my great grandfather, murdered by the Nazis. On Chol Ha’Moed Sukkot, my mother's aunt, Hanna Paltiel from Kibbutz Ein Hanatziv, merited donating a Torah scroll in memory of her father, my great grandfather, Rabbi Chaim Yehuda Aryeh Weil, may God avenge his blood, who was murdered in Auschwitz on the 20th of Mar-Cheshvan, 5704 (1943), at the age of seventy-eight. The Torah scroll was written by my aunt's grandson and placed in the synagogue of the kibbutz, which she and other Holocaust survivors helped establish. The roots of the Weil family stem from the Spanish Expulsion. Many years before the expulsion of Jews from Spain in 5252 (1492), riots and religious persecution against the Jews had increased in that country. Following one of these riots, roughly in the year 5120 (1360), my family's ancestors fled to the city of Weil in southern Germany, whose leaders sought to attract Jews to their city so they could develop its economy. The family took on the name of the city that accepted them, Weil. The father of the family's name was Yehudah, and his son or grandson was the famous rabbi, Rabbi Yaacov Weil, who in his religious law books is called Mahari"v, was one of the great disciples of Mahari"l. His son and grandson were also important rabbis in Askenaz, and they are the forefathers of our family. His father's grandfather, Rabbi Meir Weil, studied for years with the famous Gaon, Rabbi Akiva Eiger. He served as a dayan (judge) in his hometown Rogozin, and made a living in commerce. Thirteen children were born to him, but as often occurred in those days, only five survived and raised families. The youngest of them was my great- grandfather, Rabbi Chaim Yehuda Weil. Initially, he studied Torah with his father and in a Talmud Torah in his hometown. In addition, as was the custom of German Jews at that time, he also studied secular subjects. Afterwards he studied at a rabbinical seminary in Berlin with Rabbi Azriel Hildesheimer ztz”l and Rabbi David Tzvi Hoffman ztz”l, and received his ordination. Because he was a diligent and talented student, thorough and blessed with a phenomenal memory, he knew the Talmud inside out, and would go over it each year from a very young age. In addition, he studied secular subjects in university and attended lectures on the study of Semitic languages. He wrote a major work on legal matters appearing in the books of Josephus, comparing them to halakha, and was granted a Ph.D. from the University of Bern in Switzerland. People had already suggested his being appointed a rabbi, but his father lived to be ninety and required assistance; as a result, the proposals for the Rabbinate were deferred, as well as his marriage. In 5661 (1901), a few years after his father's death, at the age of thirty-five, he was elected rabbi of the congregation of Czerniaków in the province of Poznan, and married Rosa, the eldest daughter of his friend Asher Horowitz, a descendant the Shela HaKadosh. She was thirteen years younger than he. It's not easy being a rabbi, especially in those times when a major crisis had occurred in Jewish communities, and a great number of the younger generation had left the path of Torah and mitzvoth. It is possible to discern echoes of this perplexity in his first sermon. Rabbi Dr. Pozner, who has studied the history of the Czerniaków community, wrote: "The first sermon in the synagogue excelled in its language and content. The motto of the sermon was the words ‘to learn, and to teach, to preserve, and to practice’... Although within the communities' institutions, tradition was maintained adequately, the Rabbi knew that not all the members supported him, since as the new spirit of the times had found its way to into the hearts of some members of the community. In order to bring them closer, he stressed that he would be careful not to fight them with words of blasphemy and criticism, for that is not the way to draw close those who are distant, but would like to see them as friends and ask for their help, because without it, he would not be able to fulfill his duties. As Moses said, ‘But how can I handle all your troubles, burdens, and disputes by myself’, so too, he would need the assistance of all the congregants who knew all the shortcomings, gaps, and omissions in the community..
And these were his guidelines: ‘to study’ – by means of constantly delving into the Jewish sources to tirelessly prepare for carrying out his functions. 'To teach' – everyone: adults, youth and children, and to be a guide for living. 'To preserve' - to be a faithful guardian of the Torah that was given to him, to defend it from any external attacks, not allowing foreign concepts to 'enter the sanctuary'. ‘And to practice’ – to observe the Torah in an exemplary manner himself, and to show everyone the path of truth, which acted as a guiding light for the people of Israel in all the numerous stages they experienced in their land, and in the Diaspora." And Rabbi Dr. Pozner concluded: "And for his entire tenure, Rabbi Dr. Weil proved his words were true, and what he had promised on the day of his commencement, he kept all his life." His duties included the supervision of community affairs and kashrut. Once, there was a difficult case in which he had to remove the kashrut certification of a butcher who had betrayed the faith put in him, and he even went so far as to publicizeit in the local newspapers. In general, he was considered a lenient posek (Jewish law arbiter), especially in trying times, but for himself, he was machmir (strict). He was responsible for the charitable and goodwill societies of the living, and also tending to those who had passed away. Over the years, his young wife the Rebbetzin joined in the work of chesed, and was chairperson of the "Women's Society for Clothing Poor Children and Supporting the Needy." She also joined with one of the long-standing women in the community who performed chesed shel emet, preparing women for burial. According to testimony of Czerniaków residents (some of whom made aliyah and lived in Herzliya), Saba Rabba (great grandfather) was a brilliant speaker. In his sermons he presented the audience with the ideals placed before the people of Israel to be a moral example to the nations, and in this way they would be redeemed. Just as he stressed the dedication required to fulfill the commandments between man and God, he also strongly emphasized the observance of the mitzvoth between man and his fellow man. Regarding charity, he stressed the mitzvah to place the needy person on his feet so he could support himself, this being the highest level of the mitzvah. However, he also stressed that when it was impossible to place a person on his feet, he should be helped with tzedaka (charity), and not be given loans with interest, and anyone who has mercy on his fellow human being, will be shown mercy from heaven. The sermons of Shabbat Nachamu and Shabbat Chazon were very special for him, in which he expressed the tremendous sorrow over the destruction of the Temple, and the hope of the resurrection of the people and building of the Temple. Many of the young people did not understand the Hebrew language prayers very well, and consequently Saba Rabba introduced somewhat of a novelty, fashioning a prayer in German for a young couple who came to the synagogue on the first Shabbat after their wedding, and for a mother who came synagogue after giving birth. In this manner, even people removed from religion desired to attend prayers. During the First World War, dozens of members of the community joined the German army – some of them received medals of bravery and excellence from the German army, and five of them were killed. Upon returning home, he welcomed the soldiers with an important and stirring sermon, accompanied with words of motivation for the soldiers to build their lives anew from a higher spiritual level, stemming from a higher sensitivity towards the personal property and honor of others. The sermon was interlaced with numerous verses from the Torah and the prayers which he translated into German, for world peace and the salvation of Israel. He was an easy person to get along with, and cooperated together with his fellow rabbis on matters pertaining to all the communities in the area. He also participated in the ‘Society of Jewish History and Literature’, which aimed to strengthen the connection of the communities' members faced with the temptations of assimilation, to their Jewish heritage. In the framework of this organization, Saba Rabba gave lectures in the areas of Jewish law contrasted to common law. Generally speaking, Saba Rabba leaned towards the Agudat Yisrael movement as it emerged in Germany – a Haredi movement extremely concerned about the influence of secularism, however, supported integration of secular studies, in the sense of "Torah with Derech Eretz." Many do not know this, but in the Agudat Israel movement there were many who supported yishuv ha'aretz (settlement of the Land) – provided the settlements were within a religious framework. In 5678 (1917) Saba Rabba encouraged his parishioners to contribute large amounts of money through Agudat Yisrael to Israel. His daughter Flora was an activist of the Agudat Yisrael youth organization, with the goal of making aliyah to Israel through this framework. 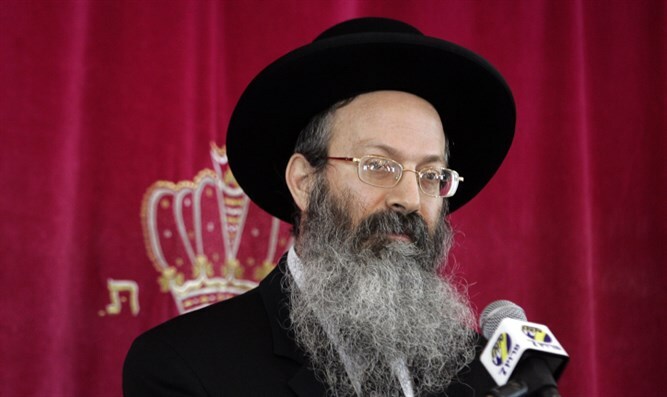 However, he refused to be an actual member of Agudath Yisrael or the Mizrachi movement, because he thought that as a rabbi, he should belong to all members of the community, and not be involved in political controversies. Following Germany's defeat in World War I, Czerniaków was annexed into to Poland. At that time, the German government was far more tolerant than Polish rule, who were more anti-Semitic and more corrupt. The Poles behaved towards the German Jews annexed to their country with extreme vulgarity. As a result the Jewish community in Czerniaków dwindled greatly, and most of the Jews emigrated to Germany and other Western countries. At that same time, the leaders of the Polish underground who were working to annex additional areas of Germany to their country, demanded a large sum of money from Saba Rabba for operational purposes, but he did not want to give it to them, saying that it was forbidden for him to 'spit into the well from which he had drunk' (the state of Germany). Instead, he contributed twice the amount of money to the Polish Red Cross organization which treated the ill. However, the Poles reacted to this severely, and subsequently denied his family the ration of coal they were permitted to purchase based on the number of individuals in each household. Coal was nearly the only means for heating and cooking at the time. Not wanting to buy coal on the black market, my great grandfather decided to leave Czerniaków. After various inquiries, he found a new Rabbinic position in the Haredi community of Dusseldorf. On Hanukkah 5680 (1919), at the age of 54, he began serving there as rabbi. After a few months, the family also joined with its five children, the oldest being fifteen, and the youngest, our Aunt Hannah, one year old. Although Saba Rabbi was a man of the book, constantly hovering over his holy tomes, he fulfilled all his rabbinic roles diligently. He gave lessons to adults and children, and a restaurant, butcher shop and an orphanage in a nearby town were under his supervision. People would come to his house with various halakhic questions; people would often come to ask questions and seek his advice even from other, surrounding cities. His honesty and devotion were clearly apparent, so that even people distant from Torah and mitzvot had great respect for him. No one could claim that Rabbi Dr. Weil was unfamiliar with the sciences or mood of the new times, for he was quite familiar with them, yet he clung to the Torah and the mitzvot with all his heart, soul, and body. One of his friends testified: 'He was the truest God-fearing man amongst the many religious leaders of all faiths I've ever met." He had a pleasant voice, and occasionally led the prayer service. Every Yom Kippur he was the cantor for the Ne'ilah prayer, and sometimes was also the cantor for Kol Nidrei or Mussaf. He once told his daughter Hannah that for him, the most beautiful day of the year was Yom Kippur. At a relatively young age Savta Rabba (great grandmother) became ill. Saba Rabba, who loved her dearly, worried tremendously about her health. He used to say that a woman becomes more beautiful as a result of the love of her husband, and indeed Aunt Hannah testified that he always considered his wife beautiful. On the sixteenth of Tammuz 5691 (1931), Savta Rabba died at the age of 51. Saba Rabba had a good sense of humor, and knew how to hold a conversation with anyone – with the most common of people, and with the greatest of thinkers. In his home, he always embellished his meals with words of Midrash or parables. He did not bless his children on Shabbat eve, but only on erev Yom Kippur, and would cry while doing so. Aunt Hannah wrote me: 'He would make-do with the minimum, and ate very little. He would not vacation, did not go to concerts or outings, but only left the house for important purposes, such as going to synagogue, or visiting the sick. He did smoke cigarettes, as was the custom of many people at the time. He was extremely studious, and would learn all the time. He used to go to bed late at night, sometimes at one or two o'clock in the morning – but never before midnight. He woke up every morning at six. In the afternoon he would sleep for about a half an hour to an hour on the couch, only taking off his shoes. He would read the daily newspaper every morning for half an hour. He was meticulous about the education of his children. When his eldest son Meyer wanted to study engineering, he assessed that engineers could not keep Shabbat in the framework of their occupation, and therefore, his son had no choice but to work in his uncle's business. Thus, amid difficult compromises, the family continued to keep Torah and mitzvoth. His nephew related that once as a child, when the world was still relatively calm, his uncle Rabbi Weil visited them at their home. To teach them Torah, he told them about their common great-grandfather, who was murdered in the pogroms of Poland 'al kiddush Hashem' (as a martyr). He also spoke about the Tanna Rabbi Akiva who was murdered 'al kiddush Hashem'. All of the story he told in German, but the words "al Kiddush Hashem" he said in the holy tongue, Hebrew, and reverently, and as a child, those words shook him to the bone. He could not know what would come to pass. At a teacher's Seminary in Berlin his fourth daughter, Rivka, my grandmother of blessed memory, met my grandfather, Prof. Yosef Volk, who came from the community of Breslau where Torah studies were only on a basic level, and almost no one studied Gemara. Saba Rabba, Rabbi Weil, was amazed at the ignorance of his son-in-law in Gemara. Before their marriage, Rabbi Weil studied Talmud with his future son-in-law for over a month, every day for a few hours. He also asked his son-in-law to promise him that he would learn at least one page of Talmud a day. And indeed, this is what my late grandfather Yosef did until a ripe old age. There was another "problem": the groom (Saba) Yosef was from a very Zionist family, a member of the HaPo'el Mizrachi through and through, and it was perfectly clear that immediately after getting married the couple would move to Israel. And Saba Rabba, Rabbi Weil, was worried lest they be negatively influenced by the secular pioneers. However, over time his fears were placated seeing that his son-in-law's beliefs were firm, even though he was not a Torah scholar and as meticulous in mitzvoth as he had hoped. In 5696 (1935) my grandparents married, and immediately thereafter immigrated to Israel. At that time the Nazis were already in power, many German Jews began to flee to other countries, and the Dusseldorf community also dwindled. From Eretz Yisrael his daughter, my grandmother, sent an invitation to immigrate to Israel. However, Saba Rabba said that the community still needed him, and that the captain must be the last one to leave the sinking ship. Shortly afterwards the Nazis carried out the pogrom titled "Kristallnacht." At five o'clock in the morning five Nazi hooligans broke into Saba Rabba's house. He was nearly seventy-two at the time. They pulled him out of his room and house, and beat him in the street. They broke the furniture, smashed the beautiful glass and porcelain dishes and glasses used on holidays, and threw the holy books out of the window. Initially, they thought to take him with them. In the end they had had second thoughts. But they stole the Torah scroll he had inherited from his father. He was pained over all of this, but was especially worried about the Torah scroll. His youngest daughter, Aunt Hannah, who was then about nineteen years old, with great self-sacrifice and devotion went to the police several times, until she was finally able to get the Torah scroll back. The community was destroyed, the Jews of Germany realized they had to flee, and thus Saba Rabba joined his daughter Flora, who had fled with her husband to Holland years earlier. They rented him a small apartment above their home. In Holland, his eyesight weakened greatly until he could hardly see. Nevertheless, he never stopped his routine of learning. He would sit all day at an open book, and with the help of his fabulous memory, learned by heart. Occasionally, when he needed to complete a word that he did not remember, he would bring the book close within an inch of his eye, read a few words, and once again continue learning by memory. He conducted himself humbly and modestly, keeping his independence, so as not to need the aid of his daughter and son-in-law. He learned to get along alone in a foreign country, and using a walking cane of the blind would find his way. Twice every day he would leave his house – first, for the morning prayers, and then later, for the Mincha and Ma'ariv prayers. After the prayers, he would remain to hear a Talmud lesson, and once when the rabbi who was teaching accidentally skipped a line, Saba Rabba pointed it out. It then became clear to the worshipers that not just another rabbi had arrived in their community, but an illustrious Torah scholar who knew the Talmud by heart. When the Nazis, may their name be blotted out, occupied Holland and began to persecute the Jews, they suggested that Saba Rabba hide. But he knew that a Dutch family would have to endanger their lives to do that, and did not want this to happen. He also said that he was not more entitled to be rescued than the rest of the masses of Israel, and whatever happens to everyone, should happen to him as well. He added, that perhaps being a rabbi, he could offer help and assistance to his brothers in the camps. In 5702 (1941), at the age of seventy-six, he was taken to a concentration camp. With the help of his cane, he would feel his way around the camp and fend for himself. There were probably good Jews who helped him as well. Every week from that very camp, a train full of Jews were sent to the infamous Auschwitz concentration camp. After about a year, when it was his fate to be sent to the death camp in Auschwitz, he had no illusions. He knew where he was being sent. Testimony remains that he parted from his neighbors with an "important and serious speech." His strong faith gave him the courage to accept the judgement of heaven, and with sacred dignity, he went to sacrifice his life 'al Kiddush Hashem' on the 20th of Mar-Cheshvan, 5704 (1943). Exactly on the same date, the 20th of Mar-Cheshvan, the day which he was murdered 'al Kiddush Hashem' at Auschwitz, the community of Bet El was established in 5378 (1977), with his granddaughter, my mother, Rabbanit Shulamit Melamed, taking part in its founding. In the community of Beit El, many of his aspirations are coming to fruition: Torah-based people who combine work and science, are meticulous in mitzvoth, do much charity and engage in yishuv ha'aretz. Even Aunt Hannah's daughter, Shoshana Weinstock, raised her extensive family in Beit El. Saba and all his children managed to survive the Holocaust, and despite all the upheavals and wanderings the family endured, nearly ninety percent of his descendants are Torah observant, and the vast majority of them live in the Land of Israel. Meyer, his eldest son, managed to escape to England, volunteered for the British army, and fought against the Germans. His second son, Shalom, managed to escape to Canada, and became a professor of languages. His only son, Rabbi Mordechai, immigrated to Israel, where he established his family. The third daughter, Flora, underwent the camps, survived, and joined her husband who managed to escape to Canada. Some of their offspring immigrated to Israel. The fourth daughter, my grandmother, Rivka, as previously mentioned, immigrated to Israel before the Holocaust. And his young daughter, Aunt Hannah, who is now ninety-six, merited dedicating a Torah scroll in his memory. 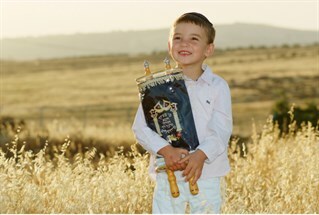 Seventy-eight years after Aunt Hannah his youngest daughter, as a courageous young girl, managed to save Saba's Torah scroll from the Nazis, she merited dedicating a Torah scroll in his memory. The Torah scroll is dedicated to the synagogue in Kibbutz Ein Hanatziv, the kibbutz she merited founding together with other dear and righteous friends, Survivors who immigrated from the depths of hell-fire in the Diaspora to Eretz Yisrael, to redeem the land and make its deserts bloom. Back then, when they came to the Beit She'an Valley, did they believe that the place would become green and so beautiful? Did they believe they would merit participating in the establishment of the State of Israel? Did they know that here, they would merit raising generations of native-born Israeli's, farmers and soldiers, lovers of Torah, the people, and the Land? This synagogue on the kibbutz serves as a spiritual center for the lives of people of faith. People of Torah and avodah, who for three generations have merited waking up at dawn, praying the morning service, and going to work in the fields of our beloved country. With the sweat of their brows they grow the country's holy fruits, engaging in the betterment of the world in the cowsheds, chicken coops, and all the other kibbutz enterprises. At this point, I would like to mention the husband of Aunt Hannah, Abraham Upp z"l, who in his great talent and hard work merited making a significant contribution to the development of agriculture in the kibbutz and the region, and to some extent, throughout the country. "Make us Glad for as Many Days as you have Afflicted Us"
When Saba walked, groping blindly, to the crematoria at Auschwitz, could he have imagined that his little daughter would live a long life, sit at her home in Ein Hanatziv, with reams of paper spread out on her table, sketching the family tree that continues to branch out in constantly growing circles? And as the years pass, the large sheets of paper with the additional pages pasted on to them, are too narrow to contain all the hundreds of names of grandchildren, great-grandchildren, and their children and grandchildren. "And the ransomed of the Lord shall return and come to Zion with singing; everlasting joy shall be upon their heads; they shall obtain gladness and joy, and sorrow and sighing shall flee away."